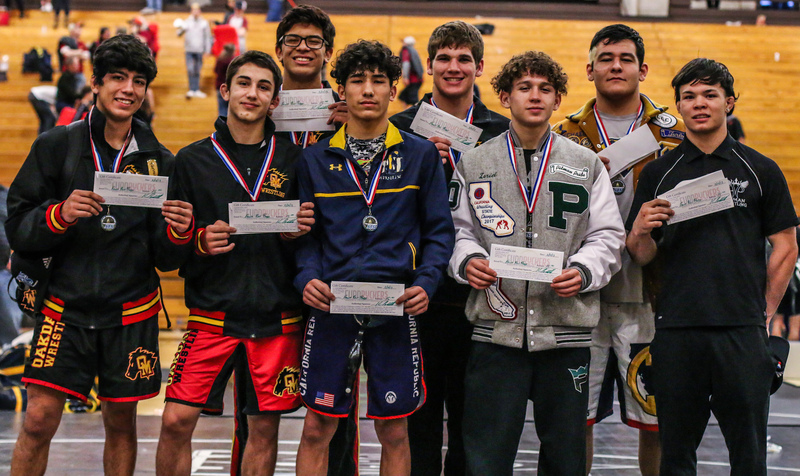 Matt Ippolito (front) guided Big Valley Christian to its first Sac-Joaquin Section wrestling championship. The man who turned around Big Valley Christian wrestling used to pick up trash in the campus parking lot and sweep hallways. Matt Ippolito started at the bottom and worked up at BVC. He was a combo janitor and wrestling coach and recruited the Modesto campus via cleaning the cafeteria among other jack-of-all -trades duties. Five years later, Ippolito’s Lions are Sac-Joaquin Section Division 6 champions. 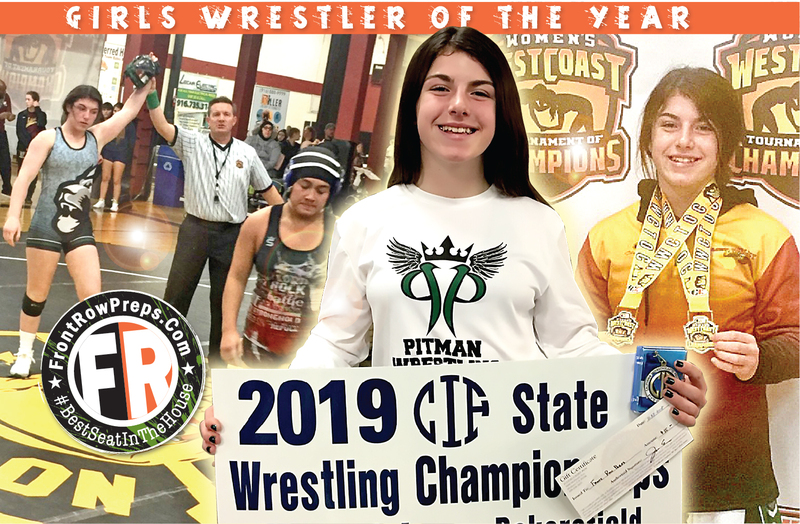 They clinched their blue banner, the school’s first in wresting and seventh overall, with their first-ever victory last weekend over resident Southern Athletic League power Mariposa. How Ippolito, 29, got here would require a small novel. He’s taken a way-out-there route, and his janitorial job only begins to tell his story. “I have a weird resume,” he said. For starters, Ippolito still is a member of the Screen Actors Guild. 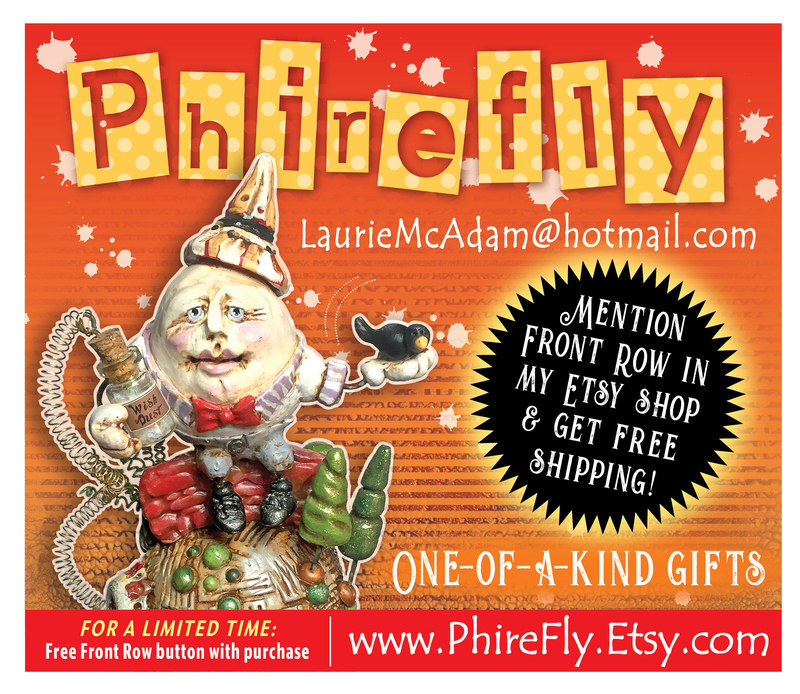 Raised in Oakdale, he was a clothing and child model from age 5 to 13 in San Francisco. He even appeared in TV ads for Burger King and Dunkin’ Donuts. 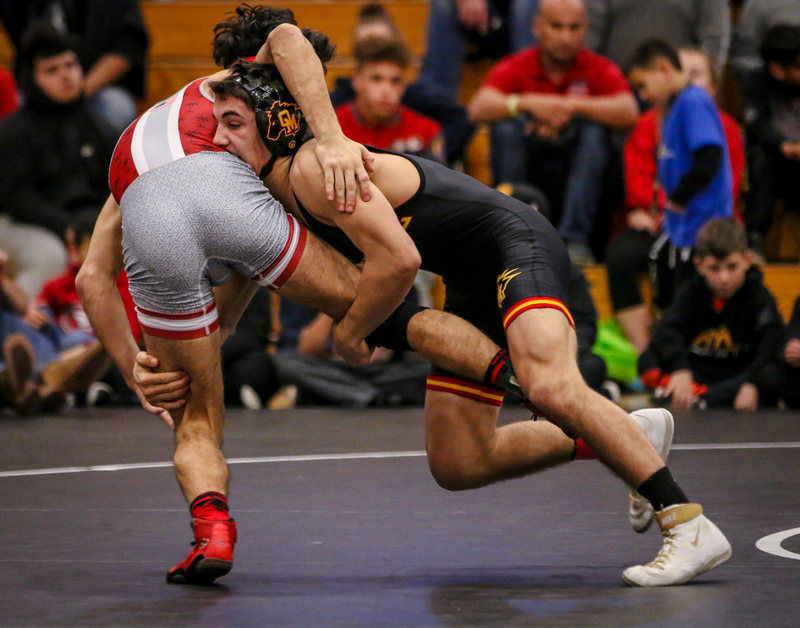 Home-schooled for many years, Ippolito was introduced to wrestling at age 10 in Oakdale’s youth freestyle wrestling program. 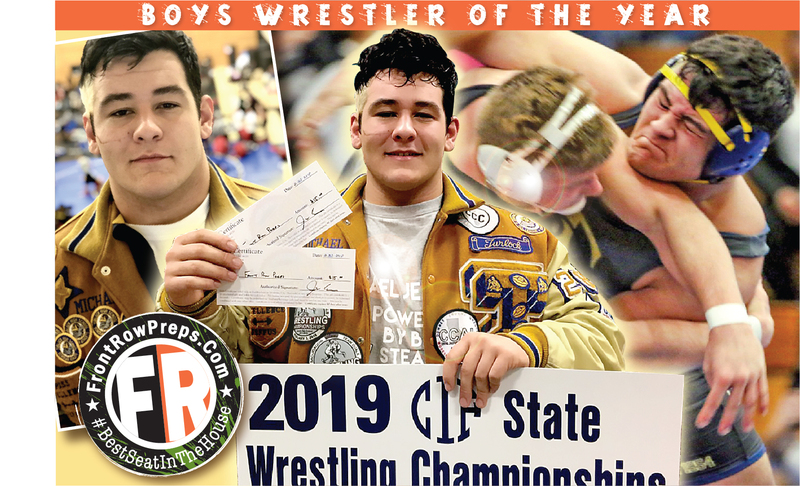 He spent one year on the mat, literally, as he was beaten regularly by eventual state high school champions Louis Bland (Central Catholic) and Trevor Machado-Ching (Oakdale). Baseball was his sport, in fact, over much of his childhood. Ippolito didn’t return to wrestling until he enrolled at Downey High as a junior. He was 39-10 as a senior but did not qualify for the CIF State Championships. From there, he wrestled for one year at the Naval Academy Prep School (Coast Guard) in Rhode Island and then transferred to Cal Baptist. Simply, Ippolito gained experience in life’s school of hard knocks. His first team at Big Valley Christian comprised of six wrestlers, all of them raw and not ready for prime time. The Ippolito name is hot-wired to wrestling in the area. Tony Ippolito, Matt’s father, is a former national champion at Biola and later coached at Downey for 20 years. Today, father and son serve side-by-side in the BVC room. Past differences were set aside, and the payoff happened this season. Mariposa edged Big Valley 42-39 during the season, leading to the rematch in the D-6 final last weekend at Lincoln. This time, BVC was ready. Javyn Drobnick, a 220-pounder who did not take part in the first meeting, ground out a pivotal 8-3 decision over Lonnie Breshears. Sophomore Briggs Alavezos (138) threw down senior Bryce Norris and pinned him in less than a minute. The Lions, who advanced to the final by overwhelming Golden Sierra 57-10, finally put away the Grizzlies 45-33 for the section team title. The Ippolito’s shed a few tears while a long-suffering team celebrated. The Lions, now 22 athletes strong, have worked hard. Senior Josh Grabowski (145) became the first BVC wrestler to reach Section Masters last year (he went 1-2). Daniel Jones (132) was unbeaten in the SAL this season. As for their coach, Ippolito is now the youth pastor at Big Valley Grace Church. The former child actor’s days as janitor are behind him as he and the Lions take a truckload of momentum into the SAL Championships on Saturday at Waterford. Ron Agostini was recognized for regional and national awards over his 40-year career with The Modesto Bee. He retired in 2017.